Phytoplankton data from 606 lakes were used to characterize indicator taxa of near-pristine reference conditions in clearwater and humic lowland lakes of Northern and Central Europe. Reference lakes were selected based on low pressure from catchment land-use, low population density and the absence of point sources. Reference lakes had low phytoplankton biomass and taxa richness compared to non-reference lakes. In low alkalinity lakes of Northern Europe, the reference communities had high biomass proportions of chrysophytes and low proportions of cyanobacteria; in the Central European high alkalinity lakes, the biomass was distributed more evenly among algal groups. Indicator species analysis and similarity analysis listed 5–29 taxa indicating reference conditions. 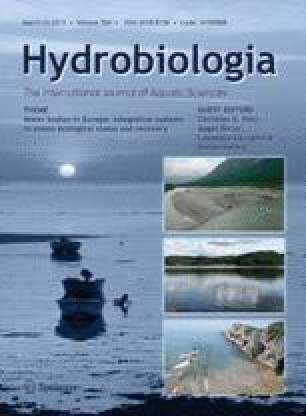 Indicator taxa differed especially between the low alkalinity and the high alkalinity lakes, but there were also country-specific differences. Most common indicator taxa for the northern reference lakes were chrysophytes (e.g. Bitrichia, Dinobryon). In the Central European reference lakes, diatoms (e.g. Cyclotella) were more characteristic. Despite the differences, there was a general finding that taxa present in reference lakes were often also present in non-reference lakes, but typically in lower biomass proportions; another characteristic of the reference communities is the absence of many taxa typically found in non-reference lakes. The online version of this article (doi: 10.1007/s10750-012-1315-6) contains supplementary material, which is available to authorized users. The paper is a result of the project WISER (Water bodies in Europe: Integrative Systems to assess Ecological status and Recovery) funded by the European Union under the 7th Framework Programme, Theme 6 (Environment including Climate Change) (contract No. 226273). We would like to thank Jannicke Moe and Bernard Dudley who supported data management and extraction and especially all the data providers: Northern GIG (Data manager: Geoff Phillips, EA, UK): Finnish Environment Institute (SYKE), Swedish University of Agricultural Sciences (SLU), Norwegian Institute for Water Research (NIVA), Scottish Environment Protection Agency (SEPA), the Environment Agency for England & Wales (EA), Environment Protection Agency (EPA, Ireland). Central-Baltic GIG (Data manager: Ute Mischke, IGB, Germany): Estonian University of Life Sciences (EMU), Estonian Ministry of Environment, Latvian Environment, Geology and Meteorology Centre, EPA Lithuania, National Environmental Research Institute, University of Aarhus Denmark, Ghent University (UGENT, Belgium), Rijkswaterstaat (RWS, the Netherlands), the Institute of Environmental Protection—National Research Institute, and The Inspection for Environmental Protection (Poland), and the following institutions of the German Federal States: Landesamt für Umwelt, Gesundheit und Verbraucherschutz Brandenburg (LUGV), Ministerium für Landwirtschaft, Umwelt und Verbraucherschutz Mecklenburg-Vorpommern (MLUV, Seenprogramm), Landesbetrieb für Hochwasserschutz und Wasserwirtschaft Sachsen-Anhalt (LHW), Landesamt für Landwirtschaft, Umwelt und ländliche Räume Schleswig–Holstein (LLUR), Senatsverwaltung für Gesundheit, Soziales und Verbraucherschutz Berlin (SenGUV), Niedersächsische Landesbetrieb für Wasserwirtschaft, Küsten- und Naturschutz (NLWKN, Sulingen). Phillips, G., G. Morabito, L. Carvalho, A. Lyche Solheim, B. Skjelbred, J. Moe, T. Andersen, U. Mischke, C. de Hoyos & G. Borics, 2010. WISER Deliverable D3.1-1: Report on lake phytoplankton composition metrics, including a common metric approach for use in intercalibration by all GIGs: 61. http://www.wiser.eu/results/deliverables/. Poikãne, S., 2009. Water framework directive intercalibration technical report: Part 2: Lakes. JRC Scientific and Technical Reports, EUR 23838 EN/2-2009. 176 pp. doi: 10.2788/23415.